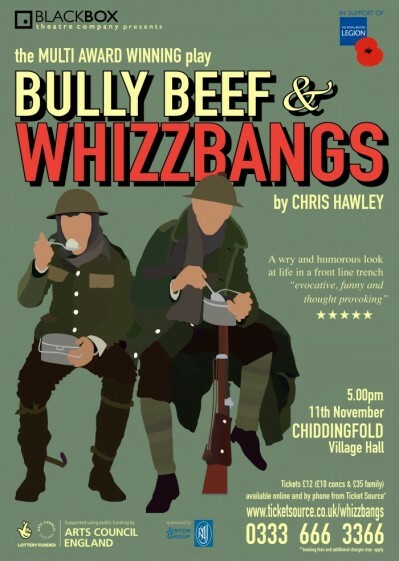 Apologies for bombarding you with yet another e-mail so soon after our last but there has been a change of timing of Bully Beef & Whizzbangs which has been brought forward to 5pm in order that audiences can also enjoy the National Tribute on the Village Green afterwards to celebrate the 100th anniversary of the ending of the First World War. From 4pm The Archive will be holding an exhibition in the Charles Watts room commemorating those on the WWI memorial in St Mary’s churchyard. Tickets are also available on sale at Treacle's Tea Shop on The Green. We will be selling tickets at the cinema tomorrow and on 2nd November. Discounted tickets are only available via www.chiddingfoldcinema.com/book-online. 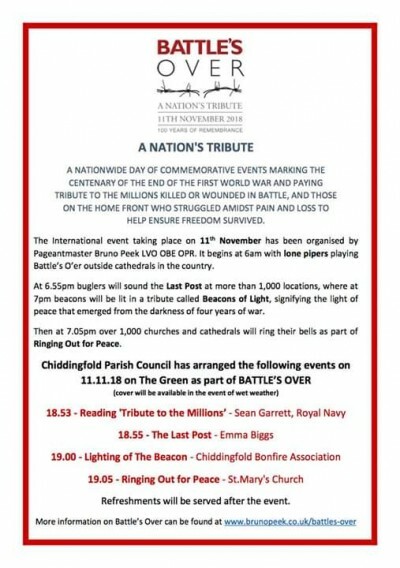 To conclude the afternoon, on the Village Green there will be a “Tribute to the Millions” at 18.50, The Last Post will be played at 18.55 followed by the lighting of the Beacon at 7pm with the church bells ringing out for Peace. There will be refreshments available after the event. We look forward to seeing you on Friday, 19th October for “The Happy Prince”. See you then!